Bring a dynamic look to your home with our selection of motion furniture. From relaxing, reclining sofa sets that give your living room the classic look of a sofa and loveseat set with the comfort of your favorite recliner to lift chairs and even reclining sectionals - with several colors and styles available, you're sure to find something you love. Our Santa Fe Silt Recliner provides the best in relaxation for you to kick up your feet to watch TV, work on a laptop or to just hang out with your family. This recliner offers the perfect balance of rest and comfort with generously padded arms and plush pillow back cushions for a daily use. With the ample seating area of this comfortable Stampede power making sure that everyone has the best seat in the house. This stylish modern design of our sectional features, oversized back and soft pillow arms for maximizing your comfort. 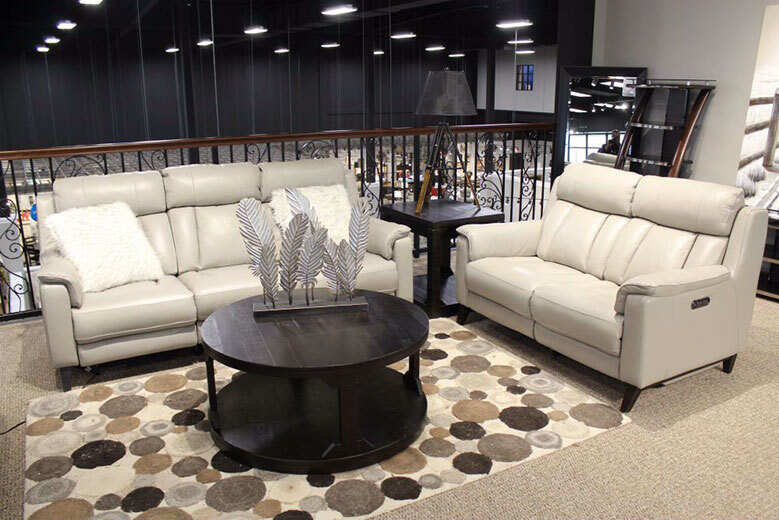 Enjoy cozy family movie nights and host classy cocktail parties alike, with our stylish Harper sectional. This is the perfect centerpiece for your seating arrangement, it blends contemporary appeal with simple sophistication for any living room. Sleek, sophisticated, with subtle contemporary lines, the Rocky Road Cocoa Recliner provides ample comfort for such a streamlined frame. It's elements are very refined, all the way down to a fresh concoction of classical track arms and upholstered wings.